Children love electronics – they are bright and shiny and there’s a lot of movement. Actually, most adults feel the same way. And there are loads of apps for babies to start teaching them life’s basics. Please keep in mind that these apps do not take the place of parents educating their children, but it helps enhance your teachings. There are two editions to this fabulous apps – Volume 1 and the Animal edition. Volume 1 includes 6 categories and 80 slides of letters, numbers, animals, objects, colors, and shapes. You also get 80 slides with the Animal version and the categories include animals from the ocean, desert, jungle, farm, forest, and the arctic. 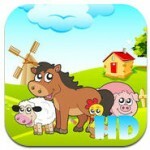 Both apps allow your child to see and then hear the sounds the animals make. You can play the slides individually, all in order, play them out of order. 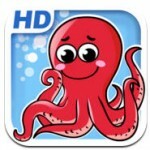 The app is very colorful and is sure to hold your child’s attention. Each edition is $0.99. This vivid app displays colorful buttons every time your child touches the screen. The name and sound of the image will be spoken when the button is tapped. Touch the button one more time and the button will disappear by “popping”. The app comes with over 50 images, but you can create your own with your photos and by recording your voice. Parents can also change the background. $0.99. 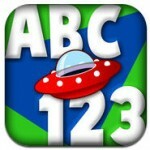 Your little one can explore sight, sound and touch with this great app. It features over 100 images in 6 categories – zoo, vehicles, farm, sea, harvest, and art. Each image is complete with sound, name, and 3 fun facts when tapped. There is a quiz section with 60 narrated questions (in sections of seven questions) designed for young children. $2.99. Teach your child 36 animals all shown in their natural habitat with sounds. The animals appear on the screen one at a time and as your child touches the animal, the sound of that animals is heard. The app is colorful and is in HD; perfect for keeping your young child’s attention, while teaching them. $0.99. Who doesn’t love this furry little red monster? Elmo sings songs and help you child learn their letters with this app. There are coloring pages, games, songs and videos all about the ABC’s. A new alphabet song sung by Elmo is also featured. Your child can touch and trace the letters on your iPad. They can also watch over 80 classic Sesame Street video clips. Parents can add their own photos and videos and then track their child’s progress. $4.99.